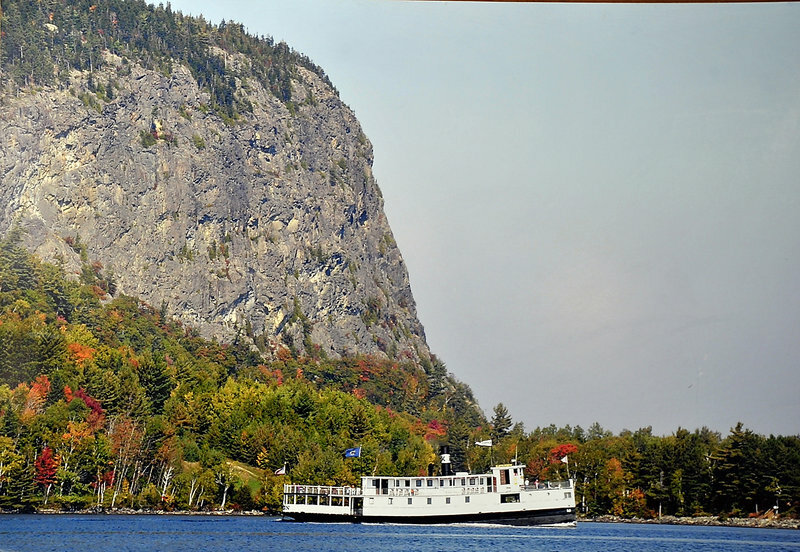 A beloved symbol of Moosehead Lake, the steamship Katahdin needs restoration so it can continue to be an 'economic engine' in Greenville for another 100 years. 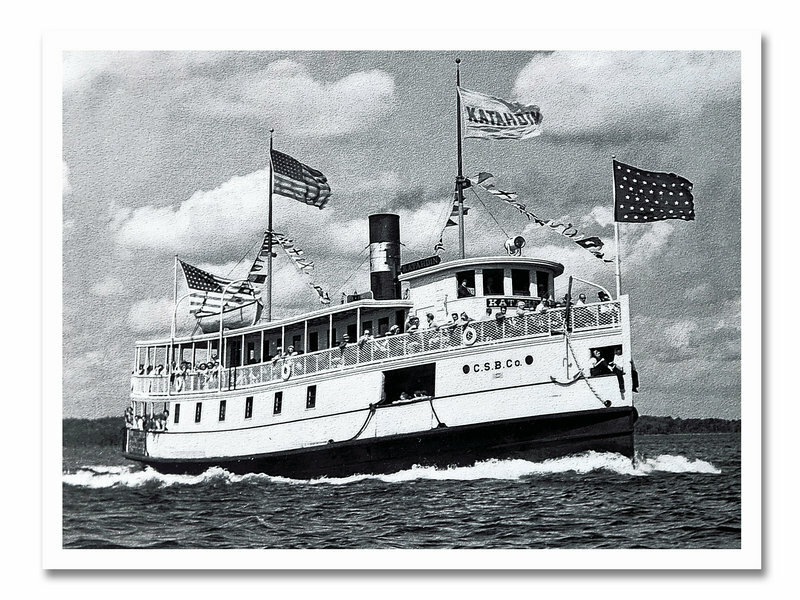 GREENVILLE – The last time workers hauled the 220-ton steamship Katahdin from Moosehead Lake, they forced I-beams through its first-deck hull by cutting it open, then lifted it up and out of the water. The process was akin to open-heart surgery, and it took years for the Katahdin, known affectionately around here as the Kate, to recover. Workers repaired a leaky hull during that last haul-out in 1994, but the mostly wooden boat sustained significant damage to its internal beams and flooring. The Great Room on the Katahdin’s lower deck serves as the dancing area when a band plays, the dining area for longer trips to the end of Moosehead Lake and a gathering area on shorter trips. The side panels are removed during cruises. Snowmobilers pass the Katahdin, moored for the winter next to the Moosehead Marine Museum, at left, in Greenville. Bubblers keep the lake water from freezing around the boat’s hull. 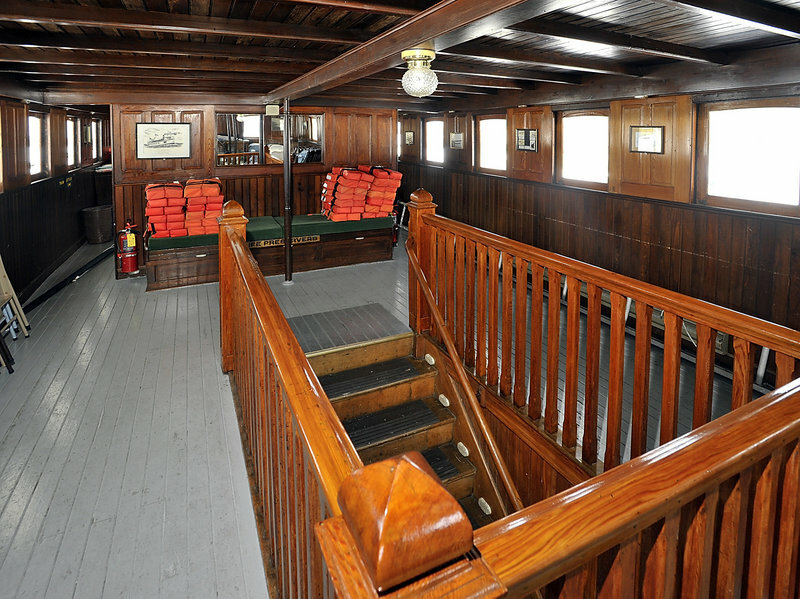 A wooden stairway leads from the Sitting Room to the lower deck. Ninety trips and two dozen charters are scheduled for the boat this coming season. Jim Castonguay, executive director of the Moosehead Marine Museum, is working with others to raise money to repair the Katahdin so it can keep cruising after this summer. 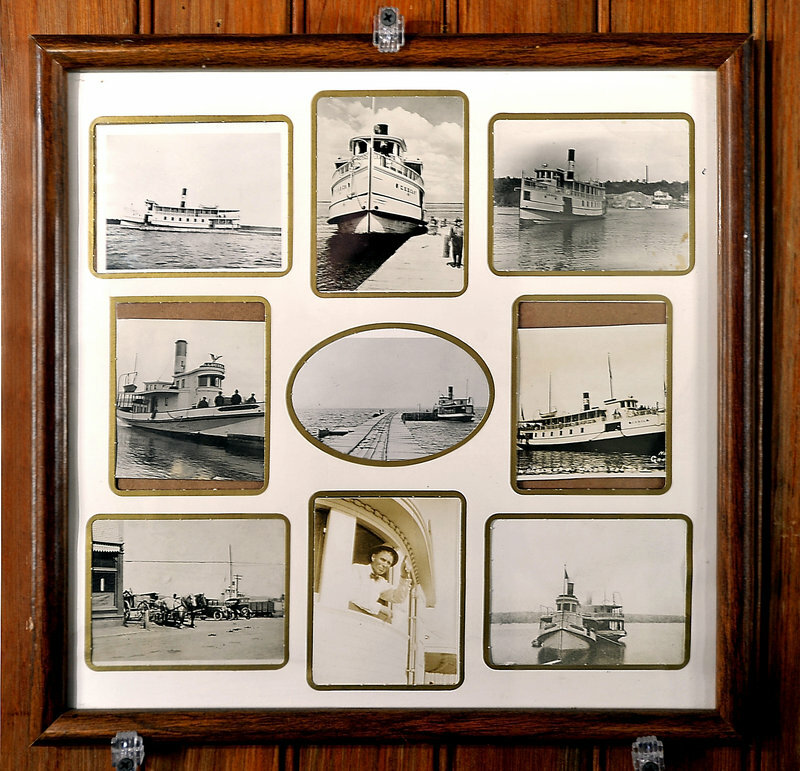 Photos in the museum show the Katahdin through its almost 100 years as a tour and log-booming boat. An archival photo from the early 20th century shows the Katahdin in its prime, ferrying tourists across the lake. It was owned by the Coburn Steamboat Company from 1914 until 1938, when the Depression took a toll on tourism. Moosehead Marine Museum executive director Jim Castonguay is determined to avoid similar complications this time around. The Kate, nearly 100 years old now, needs a new keel and a refurbished hull. Last summer, before emergency and temporary underwater fixes by a team of divers, the Kate was taking on up to 700 gallons of water a day. To ensure the landmark vessel survives into its next century, repairs are required at the conclusion of the upcoming cruising season. Castonguay has begun preliminary conversations with boat yards on the Atlantic coast that might be interested in the work. The project will be put out to bid in June, and Castonguay hopes the work will be completed in the off-season. The Kate will cruise this season as planned, he emphasized. The leaks discovered last summer have been fixed, but more extensive work is required to ensure the boat’s long-term future. The museum, situated on the southern end of Maine’s most storied lake, is embarking on a quick and ambitious fundraising campaign, hoping to raise $500,000 by the fall so it can complete the work on the Kate next winter. It has rented a booth at the 25th anniversary Maine Boatbuilders Show, which opens Friday at the Portland Company Complex on Fore Street. At the show, Castonguay and Greenville Town Manager Gary Lamb will disseminate information about the Katahdin and the fundraising drive, not only to raise money for the critical repairs but also to generate tourism for Greenville. They’ve put together a 14-minute video about the boat, its history and its role in the community that will be shown throughout the weekend. Lamb said the Katahdin is the centerpiece of the town’s history, and a primary rung on its tourism ladder. Various studies have pegged its economic impact on the town at about $1.25 million annually, he said. Lake cruises often are at the heart of many vacationers’ wish lists, he said, and the Katahdin is rented June through October for weddings, memorials and other private functions. The Moosehead Marine Mu-seum’s presence in Portland represents an attempt to build awareness for the project and raise money from donors in southern Maine. So far, about $200,000 of the $500,000 has been raised in the Moosehead area. Castonguay and others involved in the project suspect that local donors may be tapped out. The museum, which itself has an annual budget of less than $200,000, raised $500,000 just a few years ago to reinforce its lake shore, where the Katahdin docks. Last summer’s discovery of leaks and the emergency repairs required to plug them represented the beginning of huge unexpected costs, Castonguay said. “We can’t keep going back to the same people. 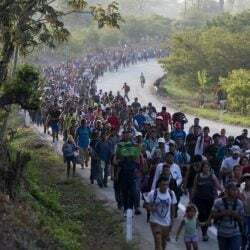 We have to expand our circle of support,” he said. The Katahdin project is complicated by geography and the sheer size of the boat. The Kate is 110 feet long, and is by far the largest boat on Moose- head. There isn’t a boat yard on Moosehead Lake large enough to handle the vessel. One solution may involve building a temporary boat yard on the lake. By using barges and creating a temporary dry dock, workers should be able to complete the project without forcibly yanking the boat from the cold lake waters. That is the hope, anyway. At stake is the future of one of Maine’s most famous vessels. Bath Iron Works built the Katahdin in 1914 as a passenger steamship. It was built in pieces that were shipped up from Bath to Greenville by rail and assembled on the lake. In its early life, it ferried wealthy summer visitors from the southern end of Moosehead to the fancy Mount Kineo Resort and other upscale destinations. The moneyed folk came up from Boston, New York and Philadelphia to avoid the searing city heat of summer. Boarding the Katahdin at Greenville represented the final leg of their long journey and the beginning of their summer fun. 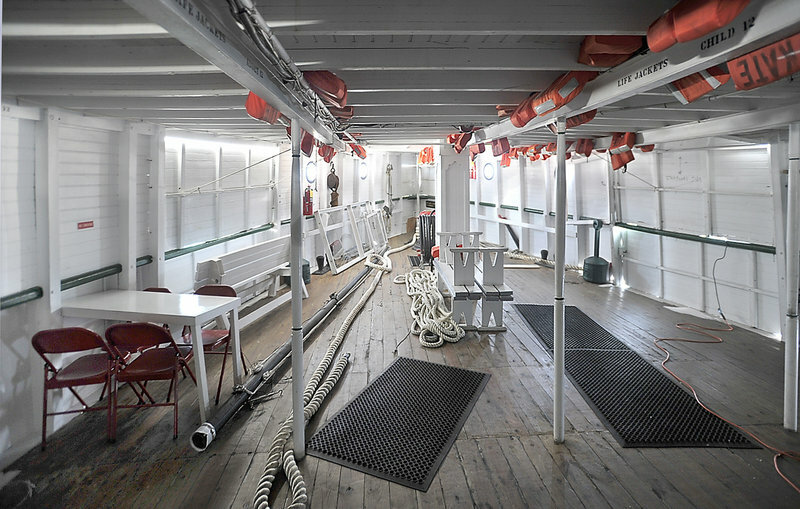 With its clean lines, open deck and festive bunting and flags, the Katahdin was Maine’s most famous party boat in the early part of the 20th century. All of that changed with the Great Depression. The rich folks stopped coming in large numbers, and the role of the Katahdin evolved into working vessel. It was outfitted for diesel, and became one of the primary boats used for towing hundreds of thousands of logs across the lake from the Maine woods to the Kennebec River for the annual river drives. When log booming was outlawed in the mid-1970s, the Katahdin lost its function. Without a purpose, the boat was slated for destruction. Among those who led the effort to save the Katahdin was Richard “Duke” McKeil, then a professor at the University of Southern Maine and longtime resident of Rockwood. 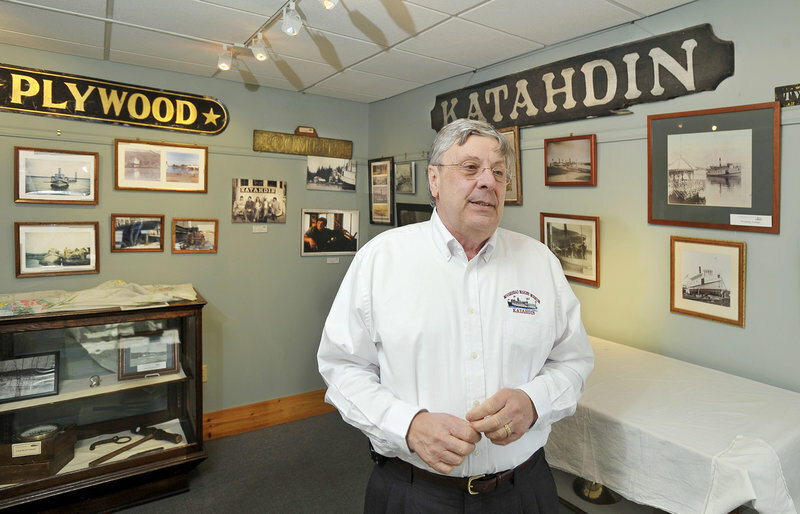 In retirement, McKeil became executive director of the Moosehead Marine Museum and was active in raising money to restore the Katahdin and build a new museum. McKeil died last fall, and the current project is named in his honor. “We’re calling it McKeil’s keel because Duke was so instrumental in saving this boat back in the 1970s. It seemed appropriate to honor him,” Castonguay said. This time of year, Moosehead is mostly frozen. The Katahdin sits at its berth in open water, bubblers keeping the water from freezing around its hull. Snowmobilers zip across the lake. With March at hand and spring around the bend, it won’t be long before the ice is out and Castonguay begins preparing the Katahdin for another season of cruises to Mount Kineo and other parts of the lake. So far, he’s got 90 trips on the schedule for the upcoming June-to-October cruising season, as well as two dozen charters. Last year, 7,200 tickets were sold for cruises on the Katahdin. Castonguay has answered a lot of questions from people about the safety of the Katahdin. Last summer’s leaks are fixed, he assures questioners.